LONDON, UK / ACCESSWIRE / September 12, 2018 / Hanergy Thin Film Power Group (0566.HK), a pioneering multinational clean energy company, continues its strong showing in 2018, delivering outstanding interim results for the period ended June 30, 2018. The company, announced on August 30th that the Group's operating revenue for the first half of 2018 reached HK$20.414 billion, registering a significant increase of 615% compared to the same period last year. The net profit for the period took a leap to HK$7.329 billion, accounting to nearly 30 times surge y-o-y. The official announcement of a huge upturn in the revenue and profit, is a testament of the Group's improved income structure and further, corroborates company's painstaking efforts to sustain the growth momentum for the subsequent term of the year, 2018. Hanergy's impressive growth numbers compared to the last year, are majorly driven by the headway of its upstream business. Interim results indicate that in in the first half of 2018, upstream business of the company, rose 10.06 times, taking a leap from HK$1.726 billion to HK$19.084 billion. Of the total revenue, the group generated, 93.5 % came from its upstream business. Another key factor attributes to the group's exponential growth is the prodigious improvement of the localization of equipment production lines, which made large-scale delivery of products possible fetching a substantial increase in upstream business. Hanergy's leadership position in thin film solar industry and consistent efforts to sustain it through unparalleled breakthroughs in technology has been instrumental in company's growth. The Group has professional R&D teams in various locations around the world such as the United States, Germany, Sweden, and China which continuously carry out innovative research and development to achieve continuous technological breakthroughs. Recently, Hanergy's 4 futuristic thin-film solar power technologies grabbed ace spot for highest conversion efficiency records released at '2018 China Renewable Energy Conference' held on August 23. Among the total 8 records released, Hanergy alone grabbed 4 records for its futuristic thin-film solar technologies including copper indium gallium selenide (CIGS), GaAs (single junction), GaAs (double junction) and Efficient silicon heterostructure technology (SHJ), accounting exact half of China's highest conversion records. Hanergy holds the record of world's most efficient GaAs single-junction solar module with 28.9% conversion efficiency, and the CIGS module with a world's record 18.72% efficiency. 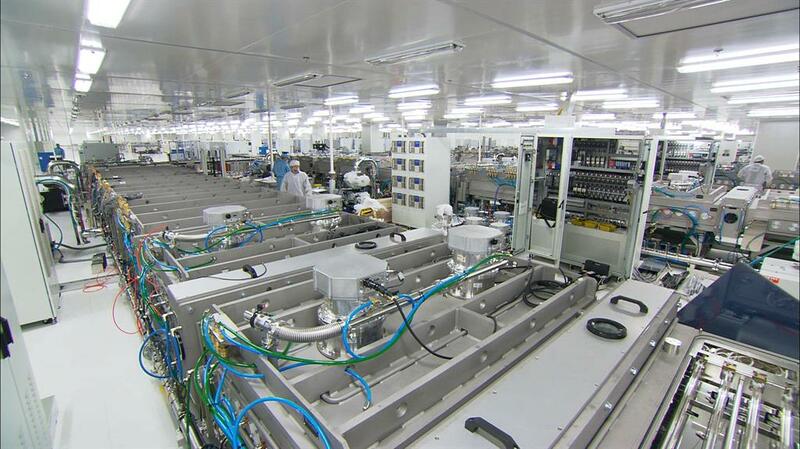 Relying on these advanced technologies, Hanergy manufactures flexible, light-weight and thin-film solar panels.